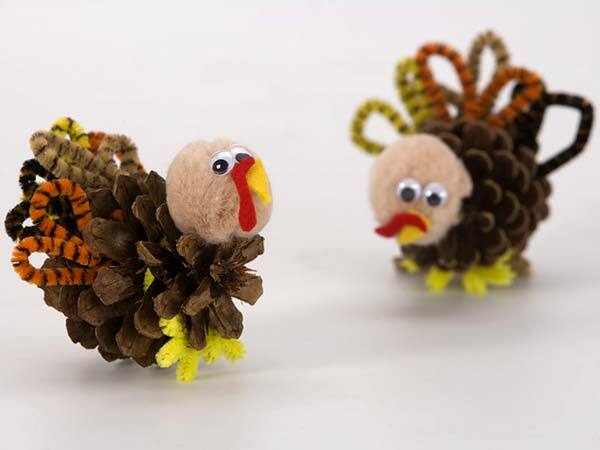 Find Thanksgiving crafts, Thanksgiving craft ideas and turkey crafts for kids here. Thanksgiving Day is a harvest festival, traditionally celebrated to express gratitude to Mother Nature, for providing good crop year by year. In Canada, it is celebrated on the second Monday of October in Canada and on the fourth Thursday of November in the United States. Originally a religious festival, now it is largely identified as a secular holiday. There is a tradition of throwing a Thanksgiving dinner on this day, especially for family members and friends. People also exchange gifts on this occasion. A wide variety of Thanksgiving gifts are available in market these days, but it would be economic to make the presents at home. Thanksgiving crafts can be made as gift for your dinner host, as party favors for your guests, as gift to someone you would like to thank or for just to keep kids busy and spend quality time with them. Turkey has a special symbolism for Thanksgiving Day and by making turkey crafts and basket crafts, you get an opportunity to discuss the legend and history associated to the day, you're your children. Turkey Prints can become an interesting family tradition and makes good memory keepsakes. Kids particularly love Turkey Balloons to play with on Thanksgiving. Easter is celebrated with great dedication and devotion all around the world. On this occasion, people exchange gifts and wish their loved ones with good health and prosperity. One can find different kinds of gifts in the market, around Easter, suiting almost every pocket and choice. However, if you want to add a personal touch to your gift, then we have just the right idea for you. Teacher's Day is a great occasion to express gratitude and thankfulness to your teacher and what better way to articulate the feeling than with a gift. Gifts, have long since, dominated the art of expressing thanks. This Teacher's Day, let your kindergartener make a special gift for his/her teacher. A personalized potted plant can be one of the best bets. Thanksgiving Day gives you an opportunity to spend quality time with your family, especially your little kids. And what better way to utilize this time with your children than to involve them in some interesting crafts. One of the crafts which kids will surely love to make is the baby turkey craft. Simple and less time-consuming, it can also be turned into an interesting family activity for Thanksgiving.